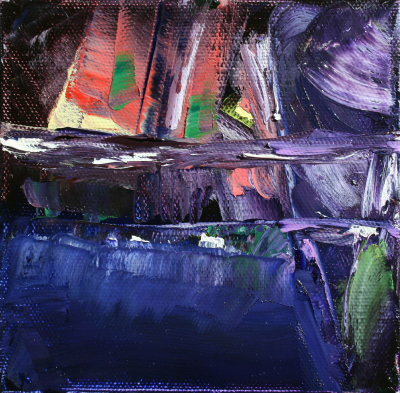 In a series of four 8 x 8 square paintings, done in an afternoon in automaton fashion on the lanai on a winter afternoon in December 2008. Oil on canvas, testing out how dark the background can get with blues, and green, purples and red. And what bright colors can bear to stand on top of it. They were experiments, like all my painting was, testing many ways to put color on canvas in order for the view to come out. We had them in our house in the blue section, and with the new addition of the pewter piece by Janet Miller they will move. Christian says, “I really like those”. We haven’t decided yet where they end up but it seem that putting them on a white background will make them stand out more. I know, I will start painting again, and the first project will be an attempt to repeat some of the abstract lighting photos in oil, seems the atmosphere colored light at night, is my bright side.